We leave Sapa in the afternoon, and head back to Lao Cai for the return overnight train journey to Hanoi. 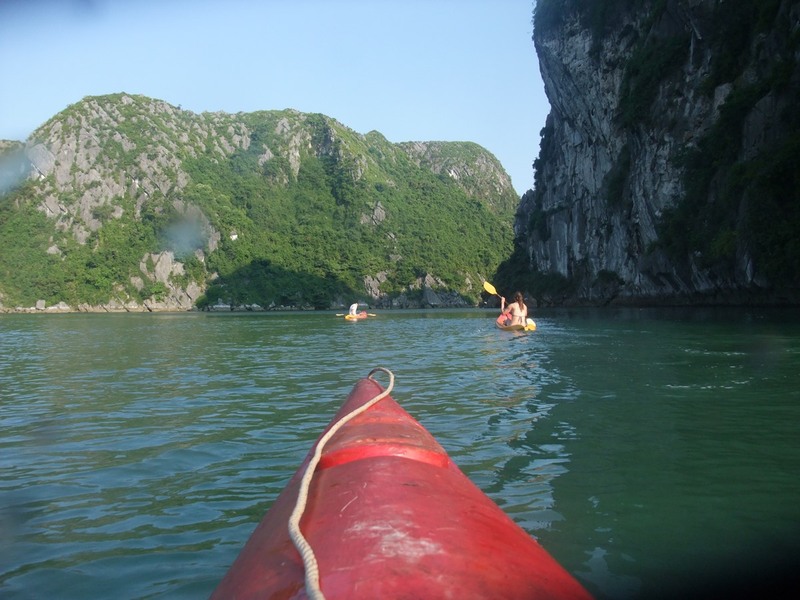 After a 2 hour train journey to Hai Phong, and an hour boat journey, we arrive on Cat Ba island, one of the two starting points to explore the very famous Ha Long Bay (think James Bond beach scenes…). Cat Ba Town is a rather uninteresting port filled with cheap backpackers’ hotels. Note the very appropriate window paintings of Father Christmas and snowman (outside temperature: 29°C)! 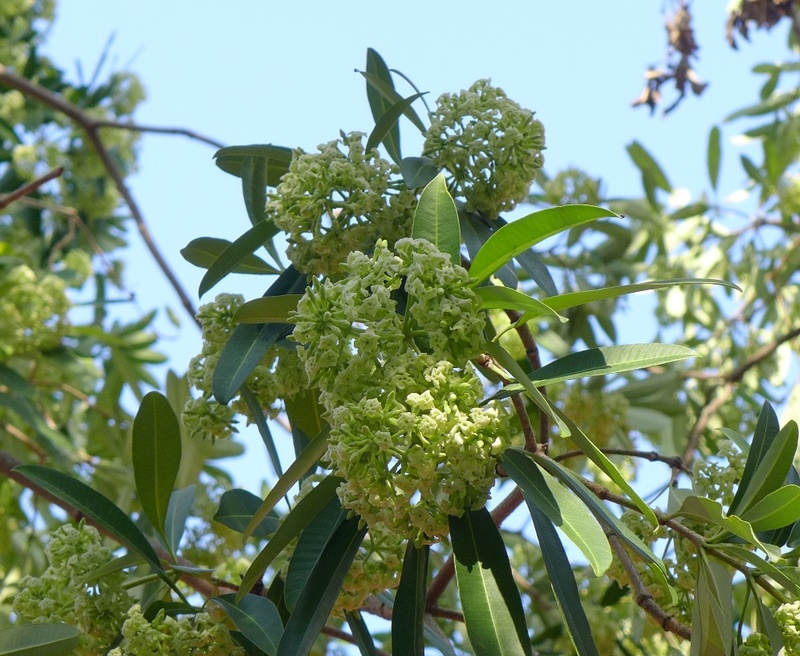 The street trees are far more interesting than the architecture, particularly Blackboard trees (Alstonia scholaris) and their green flower heads which fill the air with a strong fragrance (it reminded me of a woodland with lily of the valley). 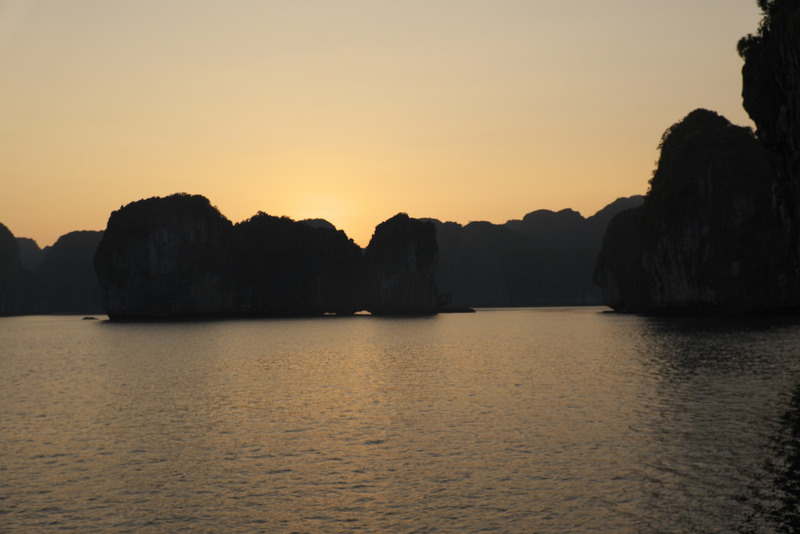 The next day we embark for a three-day cruise around Ha Long bay and Lan Ha bay. 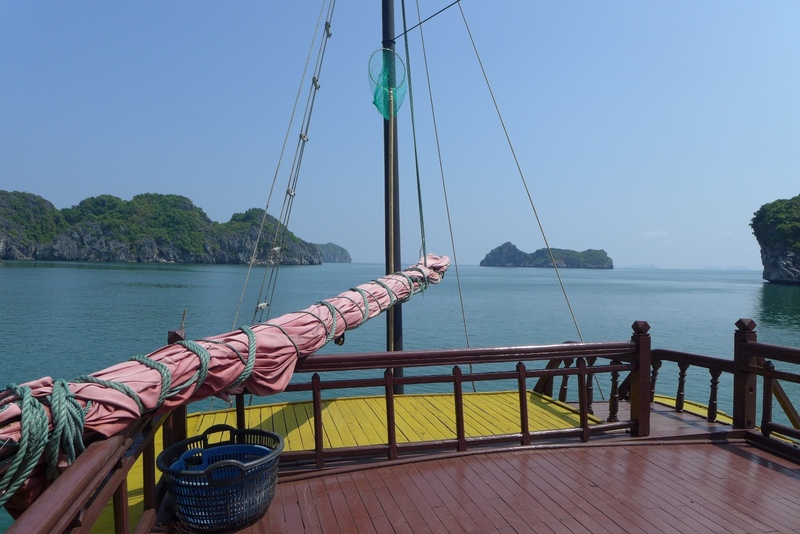 Many tourists come here on a one or two day excursion direct from Hanoi, piling themselves on enormous luxury ferries with on-board spas and shops. We went for the slightly less comfy, but so much quieter private boat. Postcard view alert here! 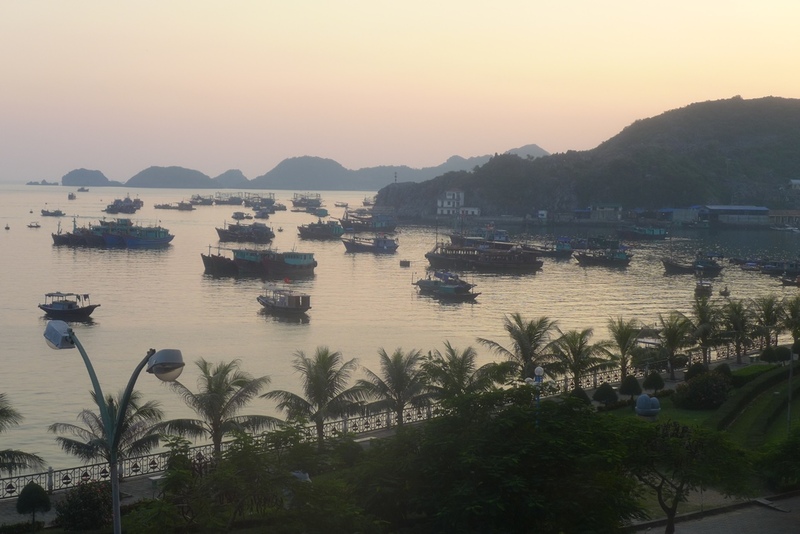 Ha Long and Lan Ha Bay comprise over 2000 islands (some which barely emerging from the sea), mainly made of limestone. 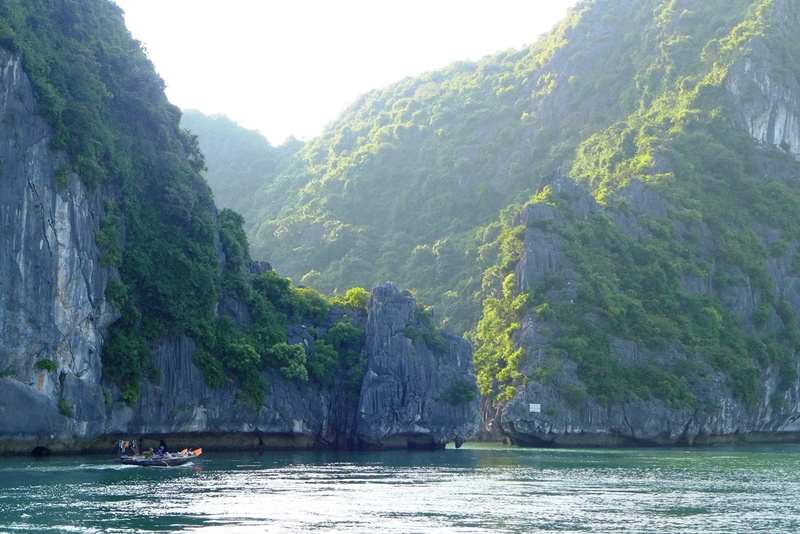 The karst landscape was formed by the erosion of the limestone to form small mountains, valleys and caves. The water level then rose massively to form the ensemble of little islands that we see nowadays. This gave me an opportunity for a closer look at the flora of these limestone walls. 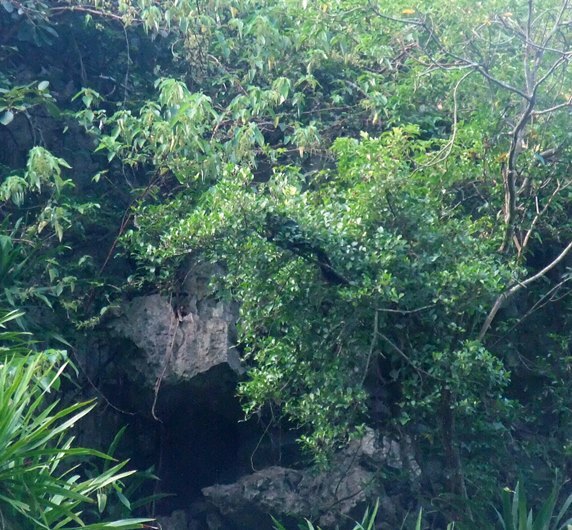 The flora is very diversified, from bamboos to palms, and changes gradually upwards (as salinity decreases and light increases). Many of the plants growing there have limited distributions and some, such as the amazing Ha Long Cycad (Cycas tropophylla) are threatened. Animals are also threatened by the intensification of tourism, deforestation and poaching. 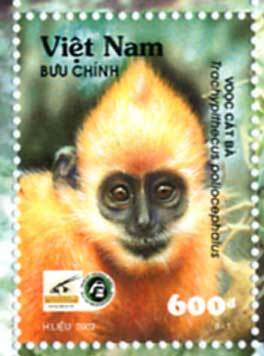 We were very fortunate to catch a glimpse of the Critically Endangered Cat Ba Langur (Trachypithecus poliocephalus), a monkey which has seen its population decrease to only around 60 individuals. The boat is finally anchored in a tiny bay where we will spend the night. 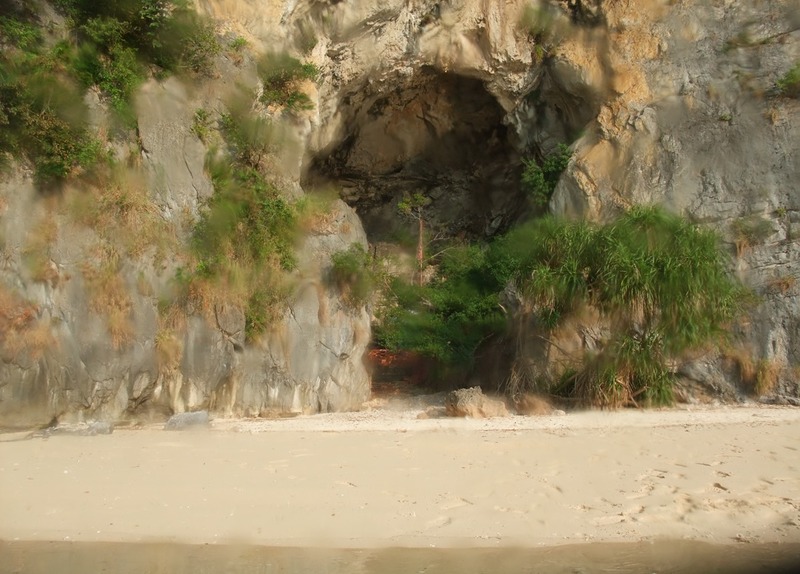 Before dinner, we swim to a small beach with a cave that is being used a shrine. There are offerings, so fishermen must come here to pray. Sadly, marine life is minimal, with mainly dead corals, rubbish (beer cans! 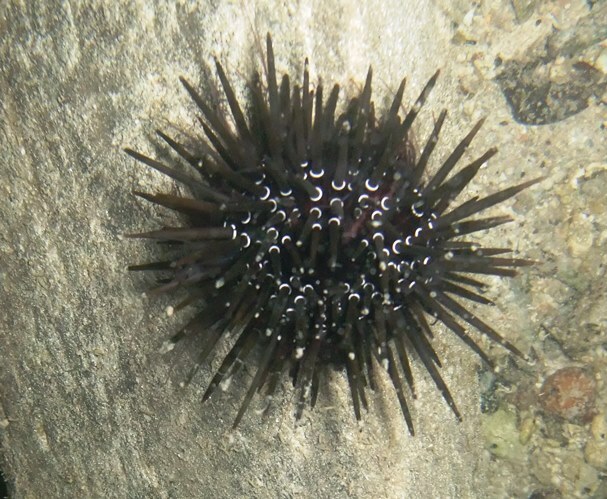 😦 ) and urchins (probably the widespread species Echinometra mathaei). Dusk falls on the bay…tomorrow is another day.